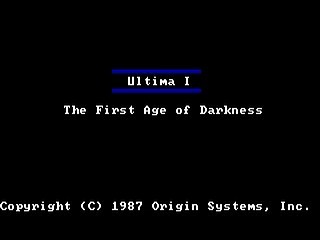 Released in 1981, and since then ported to many systems, with a re-make in 1986 which is probably the best known version, Ultima 1 is the first game in the long Ultima series. You play as 'The Stranger', an individual summoned from another world to help bring down the evil wizard Mondain, who created the Gem of Immortality and uses it to be immortal (duh). Being evil of course him and his minions make life for others pretty hard. Battling monsters, rescuing princesses and destroying alien spaceships as part of the long journey that awaits you. Good luck! Best time: Single-segment 0:36:19 by Paul 'Lag.Com' Davies on 2014-06-09. I've been promising to submit another speedrun to SDA for some time... far too long. Thankfully, RNGesus finally blessed me with an excellent streak of luck so I get to present this incredibly unlikely run to SDA! I can't go any further in these notes without thanking my wife, Mercury.Com, for serving me ridiculously tasty food and calming me down when I yell at the game for killing me the millionth time. Some thanks are also warranted for the small Skype chat I'm in that listen to my frustrations, and any other Twitch chat that I've ranted in. Ultima is the first game in an brilliant series of western RPGs which hasn't received all that much speedrunning attention so far. The earliest entries lack the strong plot and characters of the later entries, perhaps, but there's still some compelling gameplay and the seeds of genius there. As I was scrolling through my gargantuan list of unplayed games, I decided to get started on Ultima, and beat this game in a few days. Then it occurred to me just how simple it was to beat, and that with a bit of luck, it could be done quickly. Now I'll go through the sequence of events in the speedrun. The Wanderer/Avatar starts the game with 100 coins, which isn't quite enough to buy what is needed. Thankfully, there are many secrets in Ultima, not least that if you drop 10 or more coins in the north pond of a Castle, it will produce a random weapon and add it to your inventory. This makes it extremely easy to raise money, because most of the time you will make back more money by selling these weapons than you had in the first place. I also want a Blaster because it's the strongest weapon in the game. So, once I've sold the other 9 weapons (and the 2 Daggers I start with) I return to the castle to abuse the other pond. The south pond will drop 3 packs of food for each coin you give it, so I drop 50 coins into it to give me just enough before I need to buy some more. By the way, the chance of getting a Blaster by dropping in all my starting cash is about 50%. After bouncing between Britain and Castle British, I head up to Montor, the closest dungeon to the starting location. All the dungeons in Ultima are roughly the same, but of course they are randomly generated and it's not always possible to reach the ladder from the starting location without using Teleport or Destroy (which removes a forcefield). I get fairly lucky with the layout in this run. Monsters are randomly created whenever one dies; otherwise the number of monsters on the dungeon level stays constant. Because of this, the best strategy for rapidly fighting monsters is to keep going up and down ladders until they appear right in front of you. You can do this with the dungeon entrance, but this is slightly less efficient. Once I get 297 coins I leave, because that's the cost of a Raft, the cheapest vehicle which can cross the sea. Upon leaving the dungeon, I get a bunch of HP - this is the primary means of becoming tougher in Ultima, as armour is almost useless. This is one of the reasons why you don't want to raise the cash by killing monsters outside a dungeon. Bringing my booty back to Britain, I invest in a Raft and take off to visit the Castle of the Lost King. This is the first location where you can acquire one of the quests to kill a dungeon monster; the prize for each of these is a coloured gem, and of course you need all four. After getting the quest, I brutally murder the castle's jester for his jail key. This key can unlock one of the two random cells at the top right of the castle (another 50% chance). I try the useless cell first, because you will have to fight an additional guard if you open the left cell. Leading the princess out of the castle has her give you 500 HP, coins and experience. This is the other reason I use the dungeon to get coins; it is very difficult to survive combat with the guards without a little extra HP and the additional hit chance from experience. After leaving the castle, I boat my way up to the Pillars of Protection, which helpfully boost my Agility a few points. Then, I paddle over to the Tower of Knowledge, increasing my Intelligence a jot. This may seem kind of broken, and it is. However, you cannot visit the same location to gain stats twice in a row. Happily, these are the two closest locations to each other, and give the stats I want anyway. After increasing both stats to maximum, it's time to go to further afield. As a side effect, this rapidly increases the world map step counter. This counter is used to determine what is available to buy in shops; higher technology items like Aircars and Phazors only appear after a certain number of steps. My next stopping point is Ponder, to buy more food than I will ever need. Food is now incredibly cheap, thanks to my high Intelligence score, but the reason I buy so much is that Gremlins will halve your current food when they hit you, and this has ended runs before - you die instantly when you reach 0 food. After that I go talk to the Black Dragon King, who gives me a dungeon quest, and repeat the jester-princess-guard malarky. A quick stop off in Gauntlet and Nassau lets me buy the spells I'll need to finish all these dungeon quests I'm picking up - Ladder Up and Ladder Down create ladders where you are standing, which is vital for quickly diving and surfacing. Create is used in the final battle to great effect (when it works). Annoyingly, you cannot finish a dungeon quest without acquiring it first, so I have to go talk to the kings at Castles Rondorin and Shamino first. Helpfully, the dungeon Morbid Adventure is very close to Shamino's castle, so it's a good point to end up at after a whole lot of sailling. I have to kill four monsters - a Gelatinous Cube (levels 3-4), a Carrion Creeper (levels 5-6), a Lich (levels 7-8) and a Balron (levels 9-10). Despite the dungeon walls and fields being randomly generated, the ladder locations are not, so I can use them (and the Ladder spells) to climb down to the deepest levels of the dungeon with ease. As long as I don't get smacked by too many monsters on the way, it is a relatively easy task to kill the four chosen ones and get out of there. This is the fastest that has ever happened, in several hundred attempts. Shamino is special among the kings who give you quests, because as well as giving you the White Gem he also lets you pick nine pieces of armour out of his store room. One of these must be a Vacuum suit or a Reflect suit, or I have to go buy one elsewhere. On the way back through each castle, I rescue a princess, because experience is very important for the end of the game. Four castles later, I end up at Rodorin again. Time for the most bizarre part of Ultima I. If you thought the blurb on the title screen was strange, this is why. A short trip over to Gerry lets me buy a Shuttle, and take off into space. If you're not wearing one of the aforementioned suits at this point, you instantly die. Now you're in some kind of pidgin space simulation. Each sector of the area around the planet you just blasted off from can contain a space station which lets you change ship, and around 1-5 alien ships for you to shoot down. You need to kill 20 in order to become a Space Ace, which is the only reason for this entire extra game engine. I pick the ship with low Shield but high Fuel, because I want to make the trip in one go without changing ship. Shooting alien ships seems to be impossible before they get to the point where they look like |-o-| but they are able to shoot you before this; it takes about 3 shots to destroy the ship I'm using, and this has happened in plenty of failed attempts. My luck is extremely good here, as I am able to go in a small square to get the 20 kills I need. Sometimes it can take three times as many sectors. Returning to the middle allows you to land back on the planet. Newly crowned an Ace, I can go rescue a princess and get a Time Machine for my troubles. Annoyingly, I'm just below the 7000 experience necessary for this to happen (alien ships give experience when destroyed, and I was hoping to have enough by now), so I have to rescue two princesses. I also make a movement mistake rescuing the second one, which means I have to fight an extra guard. Once the Time Machine appears, all I have to do is go use it and destroy the big bad guy, Mondain. He has his own special arena to fight in, and flings several spells at you while you try to end him. Magic Missile just does damage, but Psionic Blast can permanently lower your stats. If your Agility gets low enough, it is very difficult to hit Mondain. Anyway, all you need to do is grab the Gem he's standing by, and shoot him repeatedly. Mondain regenerates a few HP every round, and once he reaches a certain level of HP he turns into a bat and starts running away. This fleeing behaviour is extremely irritating, but the Create spell allows me to trap him in a corner and repeatedly pistol whip him into submission. Despite having such a high Intelligence, Create will randomly fail. The world is saved, etc.! My next submitted speedrun will be of a longer game with even more randomness.